Welcome to our information page for our adult fitness program. We hope you enjoy getting more information about the variety of options that we offer to help you meet your fitness needs. 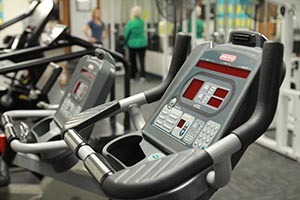 Our goal is to provide the optimum environment through use of our new equipment combined with a knowledgeable helpful staff to make reaching your goals as fun and rewarding as possible. We hope you get the information you need here, but there is no substitute for seeing first hand what Crenshaw’s is all about. There are no pushy salespeople or contracts so please accept our invitation to stop by and see what we are all about. Click here for schedule of water classes. A complete weight training circuit with new Paramount Equipment. There is a trainer on staff to help you with your fitness needs and goals. We also have free weights that the trainer can help you with. The track has a special rubberized surface to prevent abuse to your ankles, knees and lower back. It can be used for jogging or walking. Whirlpool, sauna and steam room. Treadmills, Stairmasters, Airdyne bikes, Lifecyles, and a recumbent bike. 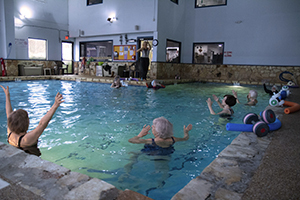 Aqua fitness - This class is designed for members with limited movement and/or arthritis. Also great for beginning exercisers. Our trained staff is available to help prepare individualized workouts. Fitness assessments available by request. Family Swim Time on Saturday 3-5 pm. Bring your family to enjoy the pool.